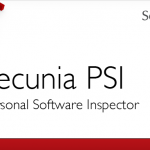 Hey !, I found this information for you: "Flexera (Secunia) Personal Software Inspector Review". Here is the website link: https://sensorstechforum.com/flexera-secunia-personal-software-inspector-review/. Thank you.